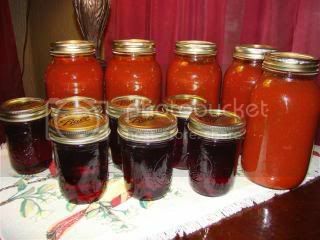 This entry was posted in Kitchen and tagged blueberry jelly, canning, salsa. Bookmark the permalink. Oh, awesome! I bought a fancy canner this year and am ready to start but I’m scared! I’ve made pickles before but this will be the first time trying to get bottles sealed. Wish me luck, pro! You are too funny! I have a pressure canner, similiar to yours, that has sat in its box for…ummmm….5? 6? 8? years…just because I am afraid of it. One of my goals for this year is to make great use of my canner. I don’t think my garden will produce enough on its own, so I hope to purchase from a couple of different farms nearby. These jars were all water bathed. I hope to make another batch of tea jelly today…earl grey bergamot and I am a bit nervous.